During the Rio 2016 Olympic and Paralympic Games, the Future Arena will host the handball games and be packed with 12,000 spectators. When the Games are over, its structure will be dismantled and used in the construction of four state schools, thus leaving a lasting legacy to the city of Rio de Janeiro. Three schools will be constructed in Barra da Tijuca and one in Maracanã – each accommodating 500 students – as part of a 178 million reais (GB£48m/US$77m/€57m) legacy project. Mayor Rahm Emanual joined CEO Lori Healey and Chairman Jack Greenberg of Metropolitan Pier and Exposition Authority, DePaul University President Rev. Dennis H. Holtschneider, and Alderman Pat Dowell to break ground for the McCormick Place Event Center in Chicago. Senior Principal Fred Clarke, FAIA and Principal Mitch Hirsch, AIA participated in the event. As a key component of the McCormick Place Entertainment District, Pelli Clarke Pelli’s new 300,000 square foot Event Center will host entertainment, large-scale conventions and trade shows, and be the new home for DePaul’s Blue Demons basketball games. It will be a world-class catalyst in the Mayor’s initiative to promote tourism and economic development. Located at the boundary of the city’s Prairie District, a pedestrian-scaled neighborhood and McCormick Place’s existing campus, PCPA’s design recalls grand gathering spaces of Chicago, exemplified by Adler and Sullivan’s Auditorium Theater and the Navy Pier Grand Ballroom.It occupies a full block with landscaped setbacks on the corner of Cermak and Indiana Streets and provides a spacious plaza for spectators to congregate before and after events. An arching roof with individual dramatic rising arcs establishes an instantly recognizable image in both the neighborhood and the city, especially when lit in the evening. With lightweight glass walls, the fully transparent main entrance creates an architecture of experience: the energy and excitement of the arena is palpable outside on the street and inside the main concourse. The Bristol Arena is one step closer after the council held a bidders’ day for contractors interested in building the venue. The five shortlisted firms attended a site visit on Monday (2 November) to find out more about Bristol City Council’s tender process. The five shortlisted companies are BAM Construction, Bouygues, Sir Robert McAlpine, Laing O’Rourke and Buckingham Group Contracting, all of whom are now busy preparing to submit bids for the 12,000-seat, GBP£90m-plus Bristol Arena, which is due to be built next to Temple Meads railway station. This is the next key milestone in the arena programme and takes us one step closer to delivery. Bristol has waited over 20 years for an arena which will at long last play a key part in the regeneration of the Temple Quarter Enterprise Zone and will make a vitally important contribution to the local economy. For the winning contractor it will be great opportunity to work with us to help shape the face of our increasingly vibrant city. International arena design team Populous together with Bath-based architects Feilden Clegg Bradley and engineering firm BuroHappold have developed plans for the innovative and flexible arena. The Bristol Arena will be a world-class entertainment venue, with a capacity of 12,000 people. The pre-planning public consultation process has recently closed and two planning applications are due to be submitted shortly. One detailed application is for the arena venue and access, and the other is an outline application for the future development of housing, business and leisure uses adjacent to the venue. The council aims to borrow GBP£53m against its City Deal and raise the remaining GBP£38m from the arena operator and car parking income. Malaysian Resources Corporation Bhd (MRCB), through its subsidiary Rukun Juang Sdn Bhd (RJSB), has been appointed to regenerate the Bukit Jalil National Sports Complex into the iconic Kuala Lumpur Sports City. RJSB’s proposal was chosen from 12 proposals submitted in an open national tender process undertaken by the government’s Public Private Partnership Unit. The first phase of the work, Project 1, will get the Bukit Jalil National Stadium ready to host the 2017 Southeast Asia (SEA) Games. Project 1 will also carry out targeted works on Putra Stadium, National Aquatic Centre and National Hockey Stadium, improve integration with current and existing public transport links, and enhance pedestrian access across the site. Project 2 is scheduled to commence in early 2018. The second phase will create KL Sports City, a fully-integrated sports hub with new, world-class infrastructure including high performance sports training facilities, a sports rehabilitation science centre, a youth park, public sports facilities, a sports museum, youth hostel, convention centre, and a sports-focused retail mall. RJSB has appointed international Populous as the project designer. We are honoured to have been chosen to carry out a project of national importance. The Bukit Jalil facilities were built more than 17 years ago and Malaysia needs a sporting venue that showcases the country and its athletes. The new sports city will be the catalyst that inspires Malaysia to become a sporting nation. KL Sports City project marks MRCB’s entry into sports and recreational infrastructure, and allows us to build on our core strengths of delivering multi-use developments that regenerate areas of national importance. By working in a private-public partnership we can ensure that our corporate goals are aligned with the nation’s objectives for growth and development. RJSB will focus on delivering a regenerated Bukit Jalil National Sports Complex with international-standard facilities for the SEA Games, which will form the heart of a new world-class sporting hub that is accessible and usable all year round. Picture: Youth and Sports Ministry secretary-general Datuk Jamil Salleh exchange documents with MRCB senior vice-resident (property and retail) Shireen Iqbal Mohamed Iqbal. NBA Champions, the Golden State Warriors, acquired a 12-acre site in San Francisco’s Mission Bay neighbourhood on Monday, where it intends to build a new, 18,000-seat sports and entertainment arena. According to a Reuters report by Rory Carroll, the vacant waterfront lot was purchased from cloud computing technology company Salesforce.com Inc. for an as yet undisclosed sum. The Warriors’ plan is unique in the fact that it would be the only completely privately-financed arena or stadium in the United States for the past 20-years. Plans for the site include an 18,000-capacity indoor arena, which will be the centrepiece of an entertainment district, featuring restaurants, cafes, offices, public plazas and a range of public spaces, including a 5-acre park on the Mission Bay waterfront. The Arena has been designed by MANICA Architecture, with Snøhetta’s Craig Dykers acting as senior design advisor. The Warriors are making an unprecedented, US$1bn investment in San Francisco. We’re the only sports team in America doing this all with private funds, on private land, with no public subsidy. A multi-use arena will play host to not only NBA basketball, but also major concerts, family shows, conventions and a variety of other attractions. The Warriors currently play their games at the Oracle Arena in Oakland, California – across the bay from San Francisco. The new arena will mark the franchise’s return to San Francisco after 47 years – the team played in the city between 1962 and 1971 as the San Francisco Warriors, before moving to Oakland. It is expected that the team will be rebranded and the former name reinstalled once the move has been completed. 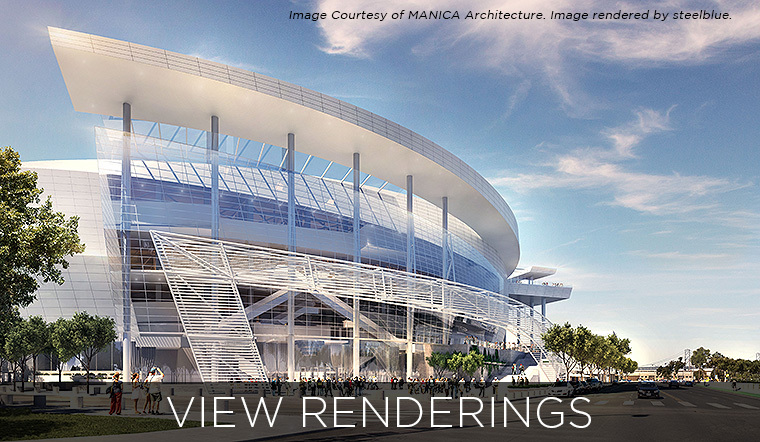 If the current proposal wins all necessary approvals, the new Arena could be open in time for the 2018-19 NBA season. With the Asia Pacific region offering an unrivalled number of sports venue development opportunities over the next eight years, we will feature a selection of projects in each edition of the weekly digest, which will also include any tender opportunities. Literally billions of dollars-worth of projects are either already underway or due to commence in the Asia Pacific region over next 12 months, with the region to play host to the 2018 Commonwealth Games, 2019 Rugby World Cup and now both the 2020 Summer Olympic & Paralympic Games and 2022 Winter Olympic & Paralympic Games. The Hangzhou Sports Park is a vibrant, pedestrian-centric recreation development currently under construction in the midst of Hangzhou, designed by NBBJ in collaboration and partnership with CCDI. Located on a 420,000sqm site on the Quian Tang riverfront, the primary architectural element is an 80,000-seat Olympic-sized stadium; which is currently the largest stadium planned for construction in China for the next ten years. The Main Stadium is intended to host major national and international events, such as the China National Games, Asia Games, and even a possible future Olympic bid. The facility will also host regular football club play. The City of Hangzhou will be bidding for several international events in the coming years. The Sports Park’s Tennis Centre is intended to be the counterpoint to the Main Stadium. It will feature several scales of spectator venues, support buildings and practice courts, and will be capable of hosting major international ATP events. The centrepiece will be the 10,000-seat Main Court. The Hangzhou Olympic Sports Centre project will be featured in our forthcoming Q3 edition of PanStadia & Arena Management magazine, which will be distributed at our ‘live’ event, Stadia & Arena Asia Pacific, as well as at the Soccerex Global Convention and FSB. Designed by world-renowned American architect David Manica (MANICA Architecture), the Shantou University Sports Park will cover an area of 60,000sqm and will house a 52,000sqm state-of-the-art multipurpose sport, conference and entertainment complex. The sports park will comprise of a 6,278-seat multi-use arena, a natatorium with Olympic-sized swimming pool, a conference centre, sport and fitness training facilities, a flexible grand conference hall, a 200-room boutique hotel and an underground car park. With an investment of RMB560m provided by the Li Ka Shing Foundation of Hong Kong, construction of the Sports Park commenced in 2014, and is envisaged to be completed by 2016. Shantou Sports Park General Manager, Greg Turner, together with architect David Manica and Star Events’ Roger Barrett, will give an in-depth project overview on Shantou Sports Park during Day 2, i.e. September 29, of our Stadia & Arena Asia Pacific 2015 event. The first phase of the ‘Morodok Techno National Stadium Project’ in Phnom Penh, broke ground in 2013. The 60,000-seat main stadium will be the centrepiece of the 2023 Cambodia SEA Games and will be completed in the next four to five years, with a Chinese grant covering the entire cost of the USD$100m project. The National Sports Complex will also be located on the site and will feature a multipurpose arena, the Prek Phnov Stadium, which will include an Olympic swimming pool, an outdoor football pitch, a running track, tennis courts and dormitories for athletes. The State Government of Western Australia (WA) recently opened two exciting new sporting facilities, the state-of the-art Western Australian Institute of Sport High Performance Service Centre (WAIS) – pictured above – and the State Netball Centre (SNC). The Department of Sport and Recreation (DSR) has been the lead client agency on both projects and contributed more than AUD$60m in funding, via the Western Australian Government. Both facilities are part of the WA State Government’s State Sporting Facilities Plan and part of an ongoing commitment to investing in major sporting infrastructure. This also includes the Wanneroo (Barbagallo) Raceway upgrade, nib Stadium redevelopment, as well as the new Perth Stadium, currently under construction. DSR recognises its project partners in Department of Finance – Building Management and Works and VenuesWest. The Department of Sport and Recreation is committed to providing quality sporting and recreation facilities for people of all ages and abilities throughout the State. While the WAIS High Performance Service Centre will be home to our elite athletes – and hopefully some Rio medal-winners – the athletes that train there are inspirations to everyone else playing sport in the community. They are also great role models to encourage young people to take up a sport. In contrast to that, the State Netball Centre is a place where anyone of any age and ability can participate in netball. It’s a long-awaited hub and home for netball in WA and is a perfect example of how sport and recreation not only encourages a more active lifestyle but how it brings community together in a positive way. We believe that when we play sport, our whole community wins. The benefits of playing sport and doing active recreation have enormous benefits other than just better physical and mental health. Being active creates social capital, fosters connected communities and can have a strong impact on keeping our young people engaged and out of trouble. Facility users: offices for Netball WA, training for West Coast Fever (state team) and games for West Australian Netball League (WANL). The adjacent Matthews Netball Centre (which the State Government also funded), hosts an average of 600 teams in their winter season – around 6,000 players (of all ages) plus spectators. That equals more than 8000 games a season and is the biggest netball competition in the State. The opening of the SNC was delayed in mid-2014 due to a fire which required the replacement of sports flooring, the eastern wall and roofing materials. The design of the State Netball Centre creatively addresses both its public interface with Selby Street and its iconic role, marking the new main entry to the Wembley Sports Park. It is a multi-purpose, high performance and community sporting facility. In recognition of this functional requirement, the design team focused on an appropriate building typology for this sporting facility. It was strongly influenced by the importance and historical context of the development of netball in Western Australia and by the urban context in which it will be located. The co-location and strong formal relationship between the SNC and the redeveloped Matthews Netball Centre highlights the historical continuity of netball in Western Australia at this site since 1961, including the 2nd World Netball Championships, with the facility accommodating community to high performance level netball. The building actively reveals its function to the landscaped street in order to promote activation and encourage use and participation. The sculptural canopy element and partially glazed north-east corner of the building serves to further reveal and integrate the activities of the SNC with those of adjacent Matthews Netball Centre. The concept of the built image is one of community participation and sporting excellence. Through architectural interpretation of site history, local topography and climatic conditions, the design team developed the built form, colour and pattern of the SNC (both externally and internally) as a highly legible sports facility which sits comfortably in its immediate context. Consistent with these contextual and conceptual influences, the external material and colour palette of the building is largely neutral and muted except for the continuous, blue aluminium fascia element, which serves to formally and visually unify the building. The building envelope was designed with Crime Prevention Through Environmental Design (CPTED) strategies in mind, with the removal of hidden spaces around the perimeter, while also providing safe and sheltered open areas for netballers and the public to congregate and shelter from the weather. Form and scale is driven by the height and volume of the sports court area. The height is determined by the minimum clear span requirements of indoor sporting competition. The design softens the visual and formal impact of this large main volume by articulating the smaller volumes of the ancillary building functions (foyer, administration offices, circulation spaces etc) that surround the main sports court area. The articulation of these separate elements, within a visually unified whole, both reduces the physical scale of the building and maintain the clarity and legibility of its individual parts. The building has been oriented so the scale and configuration of each of its facades responds appropriately and sensitively to its urban context. In addition, each elevation responds both formally and functionally to its climatic orientation and passive design parameters. Location: McGilvray Road, Mt Claremont (at the rear of HBF Stadium). WAIS is the newest piece in the jigsaw of a sporting precinct in Perth’s Mt Claremont, which includes the development facilities in WA Athletics Stadium, Bendat Basketball Centre and WA Rugby Centre. A 625m2 multi-purpose indoor sport science testing area. Hydrotherapy and recovery pools (260m2). An 80m, five lane indoor athletics track including a complete pole vault setup (with decline mechanical runway section), ability for indoor javelin / throwing sports and a long jump pit. Strength and conditioning gym – 715m2. A 280m2 laboratory for the WA High Performance Sport Research centre, including a 70m2 heat/humidity/altitude laboratory. Athlete amenities including study zone, kitchen and day area. Altitude house for athletes to sleep over night at altitude. Offices/administration for coaches and WAIS staff. Provides a daily training environment for 285 high performance athletes, over 28 sports with 14 dedicated programs. Facility users: WAIS athletes, staff, coaches, trainers and other sports experts. The building form of the Western Australian Institute of Sport High Performance Service Centre (WAIS) is inspired by the examination of the elite athlete’s physique in performance. Thus the main elements of the building’s design (structure, cladding, services and specialist functional areas) are deliberately articulated as legible expressions of the relevant physiological elements of the human body: the skeleton, skin, muscle and internal organs. The building’s form is contemporary and dynamic. Expressed structure and the use of a range of clean, strong materials are seen as recognisable visual cues to the sporting nature of the building. To create the sculptural form of the entry Glass Reinforced Plastic (GRP) was used. Material selection was guided by a desire for a slick, sleek finish, and of course something that could be formed into an organic shape was needed. Key functions are aligned either side of a circulation spine running east-west through the length of the building. This double-storey space affords external views at each end of the building to assist with orientation and allows views from the upper level administrative accommodation through to training and testing spaces. The functional design of the building reflects current best practice with provision of a high quality internal environment: controlled acoustics, ample natural light, good indoor air quality, outlook with functional flexibility in an environment that reinforces the organisation’s identity and purpose. These principles have been established through research, experience and knowledge gained from visits to elite level sports facilities. A key design feature is the connectivity between the administrative first floor and the state-of the-art testing and training spaces at the core of the building, taking advantage of increased height and voids, and allowing all support sectors of the organisation to visually interact with the heart of the facility. Canadian communications group, Quebecor, has secured the naming rights to the new Amphithéâtre Multifonctionnel De Quebec (Multifunctional Ampitheatre of Quebec), which is currently under construction in Quebec City, Canada, for its Videotron cable and wireless business. The newly-named Videotron Centre is expected to open in 2016 and is the prospective home venue of Quebec City’s on-going bid to secure an NHL ice hockey franchise. According to a report on SportsBusiness.com, as manager of the venue for the next 25 years, Quebecor will pay the City of Quebec CAN$33m (€24.4m/$25.8m) in full when the arena opens. This figure is set to increase to CAN$64.5m if an NHL franchise is secured. Quebec City’s minor league hockey team, recently purchased by Quebecor, will play at the CAN$400m Videotron Centre. According to the Globe and Mail newspapers, Videotron’s wireless service has a 12% market share of Quebec, which it will seek to substantially improve through this naming rights deal. Videotron is very proud to associate its name and all its brands with what will be an iconic building for Québec City. We have built strong relationships with Québec City residents; we have 600,000 users of our services in the Québec City area and we are part and parcel of their daily lives. So the partnership with the Québec City Arena that we are announcing today is a natural extension of that relationship. Located just outside of downtown Quebec City, the new 18,000-seat Videotron Arena will consist of approximately 64,000sqm of space with premium seating availability to include 900 club seats in the lower bowl on the main concourse level and 2 suite levels with 80 total suites and nearly 100 loge box seats. The arena – which has been designed by the joint venture of Populous and Quebec City firms, ABCP Architecture and GLCRM & Associates – will feature an array of premium seating options, auxiliary entertainment and dining features. The facility will seat just over 18,000 for hockey, with nearly 10,000 of those seats in the lower bowl. Additionally, a multitude of concert configurations will be accommodated for, ranging from nearly 20,000 for a centre stage concert to 3,700 for an intimate theatre experience. Both public concourses will be open to the seating bowl, keeping fans connected throughout the duration of the event. In addition to generously sized concession and toilet facilities, fans in the general admission areas will be provided with two open bar areas with views to the exterior. The venue will offer a diverse array of premium spaces, with the primary club space to be located at the lower concourse level, providing 900 centre-ice seats with upscale food service and a dynamic feature bar. There will also be two dedicated suite levels, with the lower level featuring 73 private suites, fully encircling the level, with seven more at the upper level. And the lower suite level will also host a gourmet restaurant with open views to the main entry hall below, as well as smaller meeting rooms for different events. For the VVIP, a “bunker” suite will reside at the event floor, offering an ‘up close and personal’ view of the players and the on-ice atmosphere, while providing the most premium amenity offering in the facility. The project is pursuing LEED Certification. New arena to form the centrepiece of vibrant sports and entertainment district north of the BMO Harris Bradley Center. The Milwaukee Bucks and their design team have released the first images and details of their vision for the development of a new multi-purpose arena and sports and entertainment district to revitalise downtown Milwaukee. These conceptual images are an important step in the process as Bucks ownership continues to present their preferred site and vision to public officials, whose partnership is necessary for the proposed development. The images depict early conceptual drawings of a new multi-purpose venue and entertainment district that anchor an ambitious new development vision activated by sports, entertainment, residential and office uses. The proposed site, which primarily sits between Fourth Street and Sixth Street from State Street to McKinley Avenue, will seamlessly link with active development on all sides, including Old World Third Street, Schlitz Park, The Brewery, the Milwaukee riverfront, Water Street and the Wisconsin Center. The vision is for an arena designed for maximum flexibility and year-round use. A dynamic entertainment district will serve as a destination that draws the people of the region together for unforgettable experiences and a place people will love to gather for generations to come. We’re not just trying to build a new home for the Milwaukee Bucks, but create a 365-day attraction for Wisconsin residents that will help revitalise downtown Milwaukee. We’re excited to share this glimpse of our vision for the future as we continue to work with our local and state partners to arrive at a viable plan. This collective effort will create a ripple effect of growth, development and transformation for the entire community and region. The Bucks recently announced the hiring of Populous to lead a group of prominent global, national and local architects including HNTB and Eppstein Uhen. These early conceptual renderings represent the owners’ vision to create a world-class facility and year-round destination that will revitalise downtown Milwaukee and spur growth and development throughout the region. We envision this dynamic entertainment experience as one that could seamlessly connect to the greater Milwaukee community. The goal is to design a lasting symbol for all of Wisconsin, pairing the crafted scale of Milwaukee’s architecture and innovative spirit with the natural beauty of the state. The arena and entertainment live block anchor an ambitious new vision activated by sports, entertainment, residential and office uses. Fronting existing Fourth Street and proximate to Old World Third Street, the site connects to the greater Milwaukee community including across the Milwaukee river to the vibrant downtown core. The arena design evokes Wisconsin’s natural beauty and Milwaukee’s rich heritage of industry and craftsmen, with expressive structure, transparency and fluid forms inspired by the rivers, lakes and forests of the region. A diverse material palette includes warmth and color, reflecting the region’s natural beauty. Selectively placed glass and moments of transparency throughout the building open views from within to Milwaukee’s skyline. The arena arrival experience is augmented by a transparent façade that marks the front door and monumental atrium within. The dynamic entertainment live block will serve as both arena forecourt and community living room. This will be the year round destination that draws the people of the region together for unforgettable experiences and a place people will love to be together for generations to come. Fans were treated to a special video presentation showcasing the energy and excitement this new sports and entertainment district will bring to the region at last night’s game against the Cleveland Cavaliers. Five shortlisted designs for the GBP£90m Bristol Arena have been revealed following a Royal Institute of British Architects (RIBA) International Design Competition. The five entries for the 12,000-capacity indoor entertainment venue went on display to the public today, 29th January, with local residents and businesses being asked for their comments. This is a once in a generation opportunity to design a great performance venue for the city region that also boosts the regeneration of the Temple Quarter Enterprise Zone. The successful design must above all function well, whilst inspiring audiences and offering a great experience for artists. The new arena must also work effectively and flexibly whilst being deliverable and affordable. I want to know what people think of these five shortlisted designs for this important venue, looking as much as possible beyond the imagery. The competition panel will consider all comments when it meets to analyse and judge all aspects of the proposals at the end of February. The judging panel are looking forward to evaluating the shortlisted teams’ work and having sight of creative vision applied to the Arena brief for this underused part of Bristol City centre. This is an exciting time for the arena project and these designs offer the first idea of what it will look like. The arena is a key part of the Temple Quarter Enterprise Zone and with the new bridge construction well underway, and an operator on board, the project is moving forwards well. The public will not know which team is responsible for which design until the successful team has been selected in March. The design competition will be judged by a panel including the Mayor of Bristol, representatives from Bristol City Council and RIBA, an experienced music and performing arts promoter and a leading structural engineer with experience of arena and stadium engineering. A successful design team will be announced in March. The Bristol Arena is due to open towards the end 2017 and will be located close to Bristol Temple Meads station in the Bristol Temple Quarter Enterprise Zone. The project is funded by Bristol City Council and the West of England Local Enterprise Partnership through its Economic Development Fund and will bring the biggest acts and millions of pounds of economic growth to the region. An earlier indicative image of how the Bristol Arena could look, produced for Temple Quarter Enterprise Zone’s marketing purposes. Former RIBA President and current mayor of Bristol, George Ferguson, has launched a design competition for a new 12,000-seat indoor arena for the English city. The move follows Bristol City Council’s agreement of a GBP£91m funding package for the creation of the venue earlier this year. A former diesel depot close to the city’s main Temple Meads Station has been earmarked for the development of the multi-purpose venue, expected to be able to host a range of entertainment events. Ferguson, who founded Ferguson Mann Architects in 1979, the Acanthus network of practices in 1986, and was RIBA president from 2003-05, became the city’s first elected mayor in 2012. He said the Arena would be key to the development of the city’s Temple Quarter Enterprise Zone, and that Bristol was the only major UK city without an entertainment arena. We have to grasp the opportunity to design a building that not only works really effectively but is an inspiring place that enriches this new quarter of the city. I want the Bristol Arena to become the arena of choice for performers, as well as offering an excellent visitor experience. As an architect I recognise that the design of the building is critical in achieving this. RIBA Competitions has helped to deliver some of the most outstanding buildings around the UK and is well-placed to help us to secure the best possible design team. Ferguson is targeting a 2017 opening for the building, with a closing date of September 18, 2014, having been set for design competition applications from interested practices. Final approval is expected later this year on the €124m proposal to build the Tampere Central Arena in Finland. The plan is to build a new multi-functional arena, which will be above the railway, located south from Sori bridge, near both Tampere railway and bus station. The Sori bridge and the Arena will be connected to each other by a deck that will include both business premises and apartment buildings. The Arena will be the new home for the city’s two professional ice hockey teams – Ilves and Tappara – and its flexible design will allow for the hosting of other sporting events, as well as non-sporting events. It is expected that 54% of the venue’s revenue will come from ice hockey, with the remainder to come from other sporting and cultural events. Besides ice hockey there will be concerts, other sport events, ice shows, figure skating, fairs and much more. The Arena will feature 50 luxury suites/executive boxes, parking for 700 cars, 2,500sqm of conferencing space, and a range of restaurants. There will also be a training arena connected to the actual Arena. It is planned that Ilves and Tappara will use the new facility as their ‘home’ and have their offices and fan shops in the Arena, which will be managed by operating company Tampereen Keskusareena, established for the project by the stakeholders, which includes the site owner, TKK (Tampere Central Arena Real Estate). Designed by Studio Daniel Libeskind, the Arena makes up part of the larger, mixed-use Tampere Deck project, which includes offices, hotels, apartments and much more. Tampere Central Arena, part of the wider Tampere Deck project. Images courtesy: Studio Daniel Libeskind. The project is being managed by Tampere Central Arena Ltd and NCC-company. The cooperation with the City of Tampere, VR (the national railway company) and Trafi are essential for the project to come to reality. As experts in their fields, the project team has heard from Oy VR-Rata Ab, Ramboll Finland Oy, Sport and Live Vision, J.R.A Consulting, Aihio Arkkitehdit Oy, Deloitte, Ilves-Hockey Oy and Tamhockey Oy. Tampere Central Arena is owned by Ilves-Hockey, Tamhockey, Kirves Sijoitus Oy and Arena Holding Tampere Oy, each holding an equal share. For the two ice hockey teams, the new Arena will give new possibilities to develop their activities and expand the possibilities to attract new supporters. The city will put €22.4m towards the building costs, with €91m to come from private investors of which €50m will be financed through long term loans. The construction time is planned to be three years, with completion aimed for 2017. This project is so important for the image of Tampere City that this kind of investment is justified. What a fantastic opportunity to work in Tampere on an urban scale. Given the extraordinary history of modern architecture in Finland, it is a particular challenge and opportunity to extend that tradition into the 21st century. The world’s largest indoor arena, the 50,000-seat Philippine Arena, has opened in Manila. Located at Ciudad de Victoria, Bocaue, Bulacan, the venue was commissioned by Iglesia Ni Cristo (the Church of Christ) as their gift to the community and was completed in time for the Church’s Centennial Celebration on July 27th 2014. Populous designed the AUD$200m facility, with construction carried out by Korean firm, Hanwha Engineering and Construction, following an extensive search throughout Asia to find the most suitable construction company. Situated on a green field site north of Manila, the arena is of a scale not previously seen in the Philippines and will put the country on the world stage. It has been master planned to cater not only for 50,000 inside but has the capacity for an additional 50,000 people to gather at a ‘live site’ outside the building to share in major events. There is a growing trend, especially in Asia, for large arenas with a focus not on sports but rather entertainment and the Philippine Arena has built in flexibility and future proofing to cater for this new market. The crowds in Asia are larger than Europe or America and while professional sport is still in its infancy, people want to see the mega music stars of the West. The new arenas are increasingly also designed for concerts offering larger audiences to the artists in a safe and bespoke built environment. Safety and entering and leaving the building efficiently were the first priorities, and then we wanted to create a building where everyone could see and hear one person at the front of the stage as clearly as possible, where there was also a sense of intimacy and a connection, drawing on the atmosphere created when you have 50,000 people in the one space.We worked to achieve a tight, compact and shallow seating bowl, which is also gracious with its saddle bowl form, high in the centre and dropping down at the flanks. This enabled spectators not only to be able to see the speaker on the stage, but also meant they would be very aware of the other 50,000 people in the arena, so helping create atmosphere. The Philippine Arena will be one of the Venues in Profile featured in our forthcoming Autumn/Fall ’14 edition of PanStadia & Arena Management and is also one of the projects to be unveiled during our Stadia & Arena Asia Pacific event, with Andrew James to describe the project in full detail during the conference. There was no mistaking a major theme coming through at the IAKS Congress and Awards: multi-use as a way of achieving economic sustainability, including the combination of large spectator facilities with community use. Examples included London’s legacy venues, the Copper Box, Velodrome and Olympic Stadium. Neil Fraser from Make Architects described how the Copper Box was designed to very quickly become a multi-use facility driven by the needs voiced by the local community, including schools. The Velodrome is undergoing some fit-out – a cafe and a reception desk – but most of the work is on the extended velo park next door. The ‘New approaches to design and management’ session typified the different possible approaches to multi-use, from the architectural and engineering solution in Lille’s Grand Stade to the multi-functional training centre in Xativa Sports City in Valencia and the Salvation Army Ray & Joan Kroc Corps Community Center in Phoenix, USA. Chairman Sven-Ake Wikers put questions about programming, energy use and identity to the panellists, whose buildings, although with varying capacities, all need to serve different event clients with short turnaround times and as efficiently as possible. Lille’s stadium is a sports stadium, sports arena and concert hall in one facility. It achieves this through having a sliding roof and a pitch that stacks internally. Architect Pierre Ferret reported that during its first season, each half of the pitch has retained its performance and appearance due to the maintenance regime. He also confirmed excellent acoustics for pop and classsical music in the curtained hard floor ‘boite des spectacles’. Xativa Sports City is a renovated park with 8,000 sqm covered and 40,000 sqm of outdoor athletic, aquatic and fitness facilities, plus cultural, meeting and education spaces. Architect Maria Angeles Sanchez Ortega used colour to define areas for different user groups and integrated storage for team equipment. “During construction we always tried to reduce costs to adapt the project to affordable prices,” said Ortega in response to a question on architecture in a time of austerity. The question of finance was also fundamental to the Salvation Army Ray & Joan Kroc Corps Community Center in Phoenix, one of 26 such centers funded by a private endowment of $1.5bn. Architect Craig Bouck described the selection process carried out by the Salvation Army, the organisation entrusted with the task of providing facilities to underserved communities, and its journey towards delivering leisure and cultural facilities, which it had no previous experience of doing. In Phoenix, the Center provides indoor and outdoor facilities, responding to the climate with shaded areas, water preservation and natural lighting and ventillation. Typifying the new thinking, the chapel is at the front of the building on the ground floor and immediately above and also at the front is a boxing gym, which appeals directly to the sporting instincts of the local community.